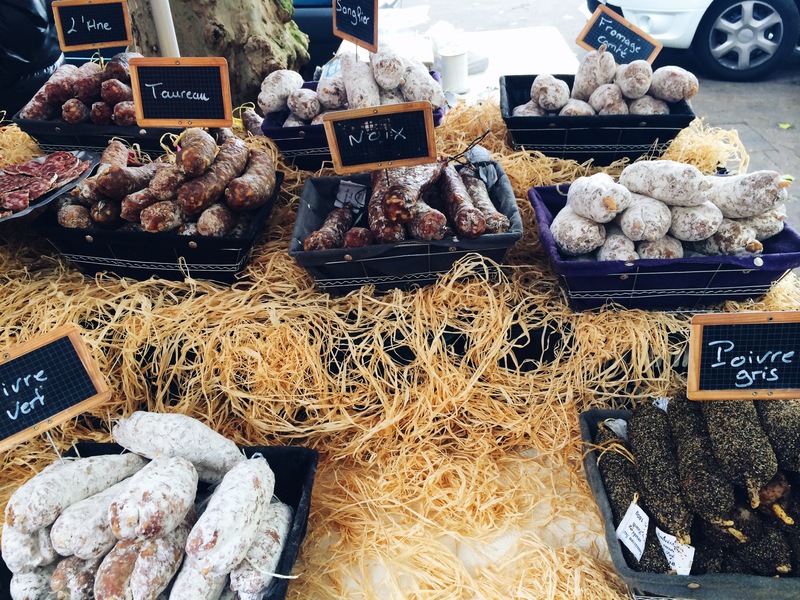 As I unpacked my bag from the last few days of travelling in France– with everything I own smelling like a mix of cigarettes (not from me, stop freaking out, Mom) and some olive sausage I brought back– I came to realize three truths. 1) I am incredibly lucky to have friends all over the world, close enough friends that will share their lives with me when I visit, 2) everything you hear about how wonderful French food is, is true, and 3) the only real universal language, at least for people my age, is having fun. 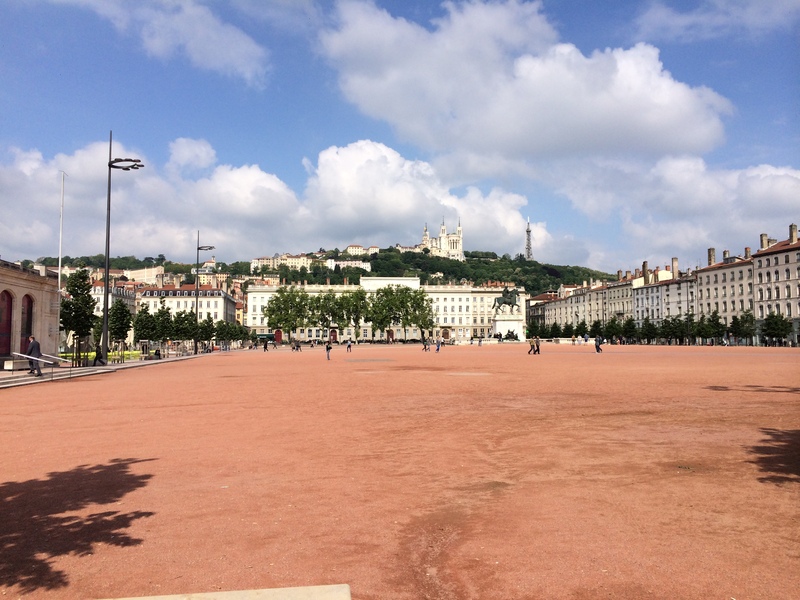 Nat and I decided to have our last trip be a relaxing one, and chose Lyon. I knew someone who lived there, Constant, a French boy from when he came to live in Dallas with my friend George for a bit 4 years ago. We knew each other for only a few weeks but kept in touch, always saying we would see each other one day. I asked Constant where we should stay and what we should do in Lyon, and he took this as planning our entire trip and even hosting us in his family home; he just started summer vacation and had the time. Nat and I couldn’t believe what we got to experience for the past 4 days. My favorite parts of the trip were definitely the beauty of the city (you can’t miss it, anywhere you go), meeting new people my age from a culture I knew relatively nothing about, and simply relaxing in a city while Constant took care of us. There was no pressure to hustle around and see everything, we had enough time to get it all done. Constant picked us up on Wednesday afternoon. He was exactly the same as I remembered, and he said I was as well. He also announced that his English was still bad, and the worst of his friends. I thought he did just fine, and we even had conversations about politics with hard vocabulary. 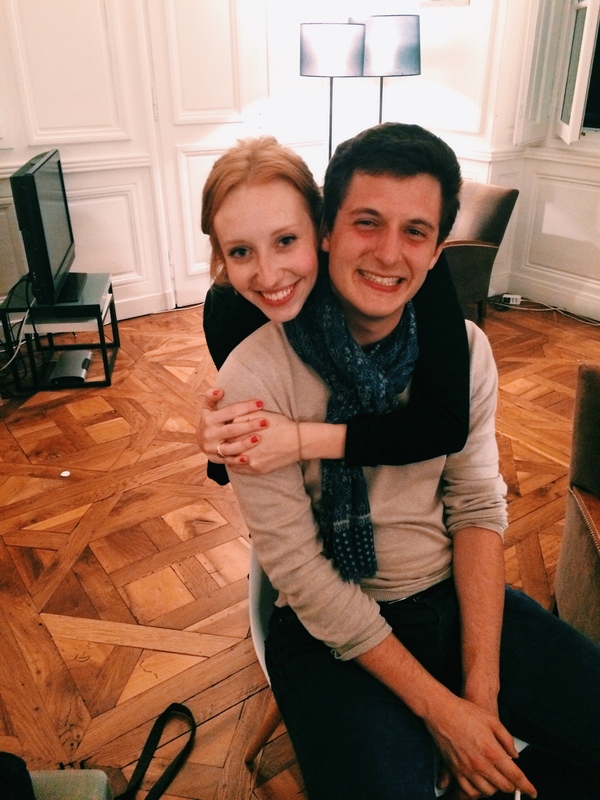 Nat used to speak French, so they tried a little, but we did the best we could. He took us to his home and when he opened the beautiful french blue door/gate hidden in a wall of ivy, we honestly couldn’t believe what was behind it. 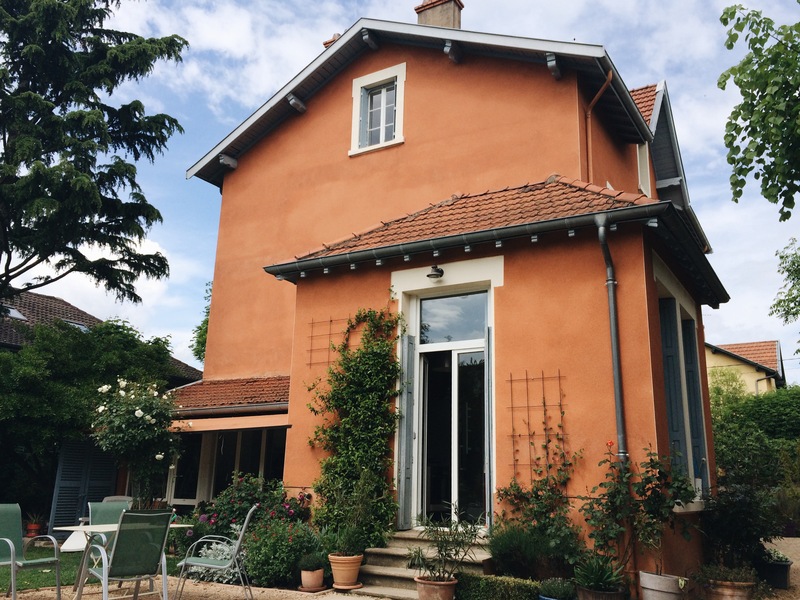 A beautiful bright orange French country house stood in front of us, with beautiful gardens and an adorable Lab named Uno. I didn’t realize that Constant’s family hosts exchange students frequently, so they were already prepared for us. 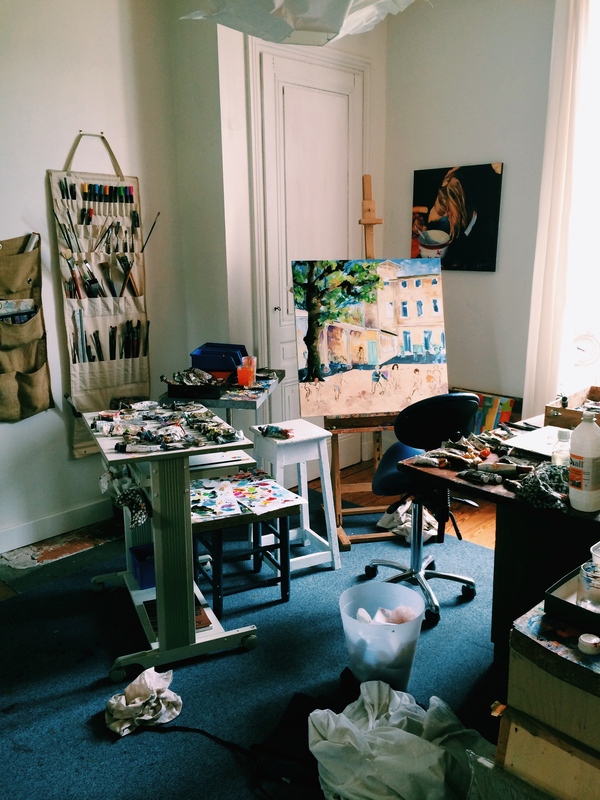 His mom, an artist whose work is all over the house, came home while we were getting settled. She, as well as his father, speak very little English. Constant translated for us, but I really hope our gratitude translated as well. We took them stroopwafels. 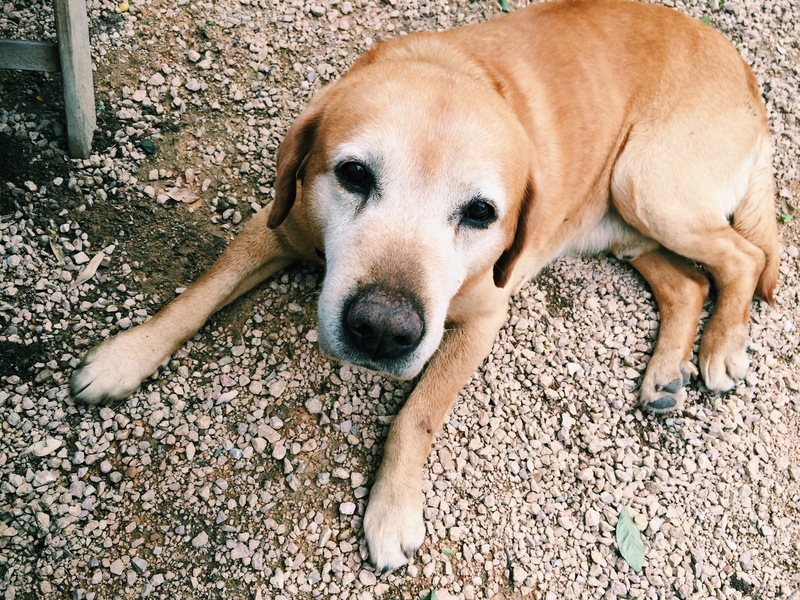 Uno, the first dog I’ve had the chance to show some love to in a while. We spent the rest of the afternoon and evening exploring Vieux Lyon, taking pictures and eating pastries while Constant met with a friend. Later that night we went into the downtown area to one of his friends’ houses for a party. We were imagining an apartment, but no, this was a full-scale house that happened to be up in a building downtown. 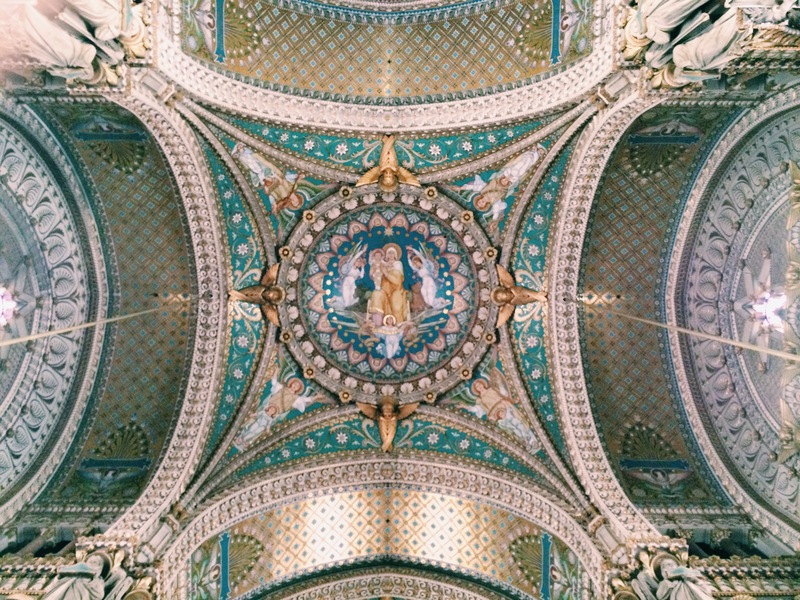 The ceilings were high and beautiful and everything was old and French. We met a few of Constant’s closest friends, one of which was a countess and she tried to hide this from us. Their English skills varied but everyone was friendly nonetheless. There were a few moments where Nat and I just sat and looked at each other while this whole French party happened around us, everyone jabbering on and us having no clue what was happening. We stayed until the wee hours of the morning, I have a list of the French songs that were played so I can remember the night. Nat and me on one of the Lyon bridges. 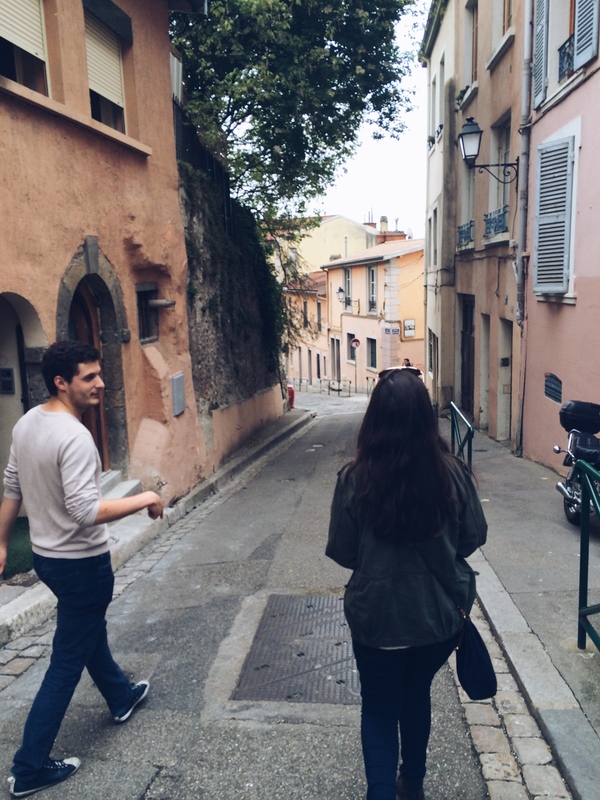 The kids walking around Old Lyon. 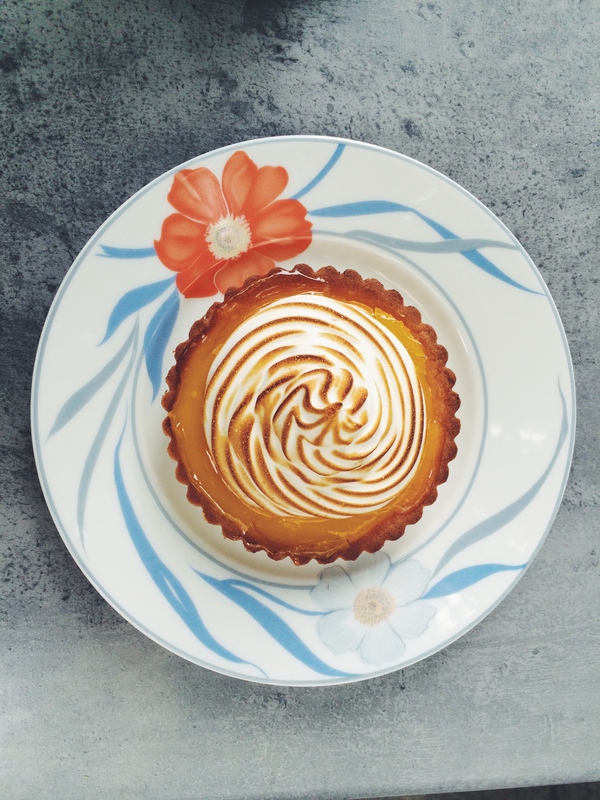 Our first lemon meringue tart of the trip. Our first night with Constant’s friends. The next morning was spent sitting around Constant’s kitchen table and trying a variety of French condiments on miniature toast. 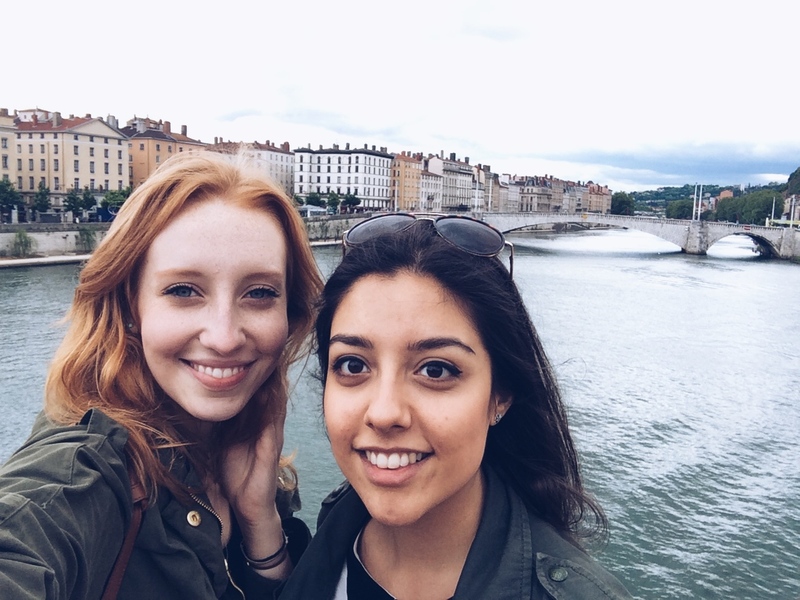 Constant is so enthusiastic about life in Lyon and wanted to show us absolutely everything. A lot of his friends haven’t left Lyon or won’t be studying abroad. They really love it there. Anyway, we made the effort to drive up to Basilique Notre Dame de Fourviere for the famous view of Lyon from above. Fourviere was incredible. The inside of the church was also stunning. Luckily it was clear enough to see the city. Constant drove us up in his teeny little car, which was an experience in itself. He told us we would return to his home for lunch with his family, and yet again we were blown away by a perfect table setting outside in their garden, pork with mint cooking on the grill, various salads, and even a sponge cake with homemade blackberry jam that we saw his sister working on earlier in the morning. We were so spoiled. 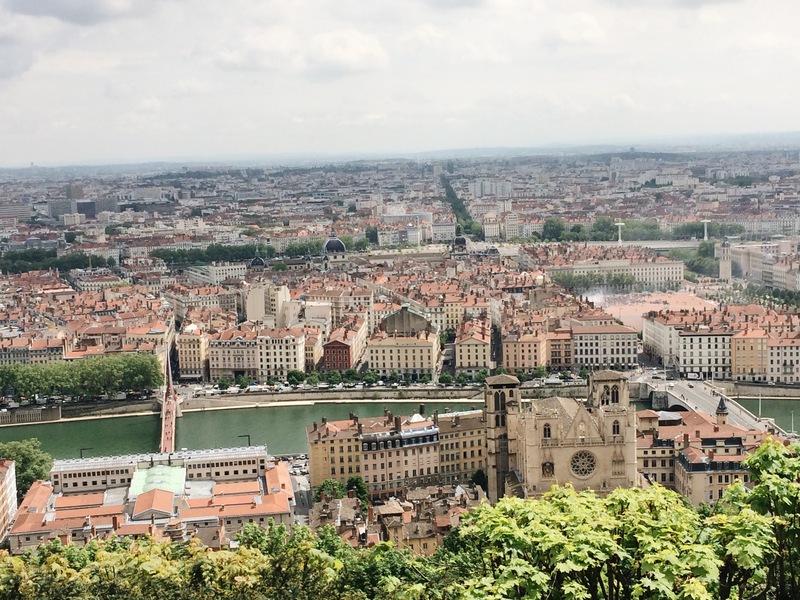 View of Lyon. I believe the bridge on the left is where Nat and I took the earlier picture. Post-lunch cheese at the Delouis house. We headed into the city for more exploring and to meet up with another one of Constant’s friends for coffee. It was May Day, so no public transport was running and many stores were closed. 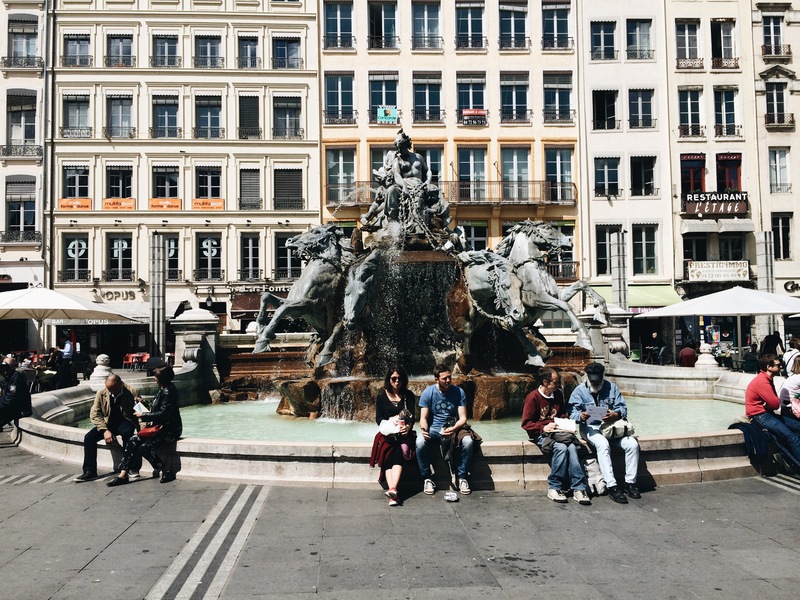 We still enjoyed strolling around, saw Place des Terreaux, and one of the girls Natalie knew from an exchange in high school came to meet us for coffee as well. Reunions all around! We went back to rest at the house for a while before heading back into the city for dinner. 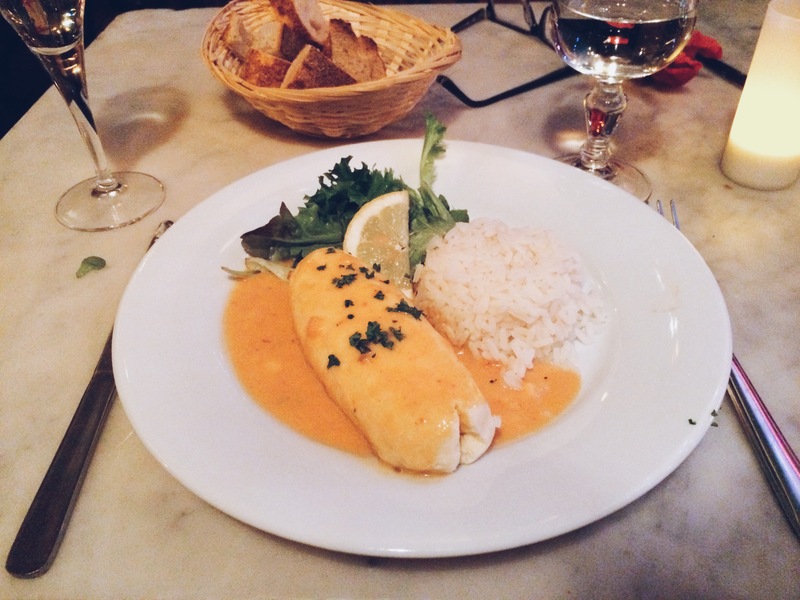 We wanted a real Lyonnaise dinner, and had just talked to Constant’s parents and a few of their friends at the house about quenelle, a Lyonnaise specialty that can’t be explained. We went on a hunt, and I was successful. We decided on Le Saint Joseph, a nice French restaurant that advertised a quenelle. The only way to explain quenelle is like a Czech dumpling, but if you haven’t had that, then I don’t know what to say. It’s a soft, doughy/eggy loaf with fish flavoring, and mine was covered in lobster sauce. I really enjoyed it, despite being scared at first! We had a pudding for dessert, walked around town a bit more afterwards, and then headed home to get to bed early while a beautiful French thunderstorm struck the city. I had missed those. We started Friday with Croix-Rousse, a very beautiful part of Lyon with more cobblestone streets and hills, and walked to see Le Mur Des Canuts. 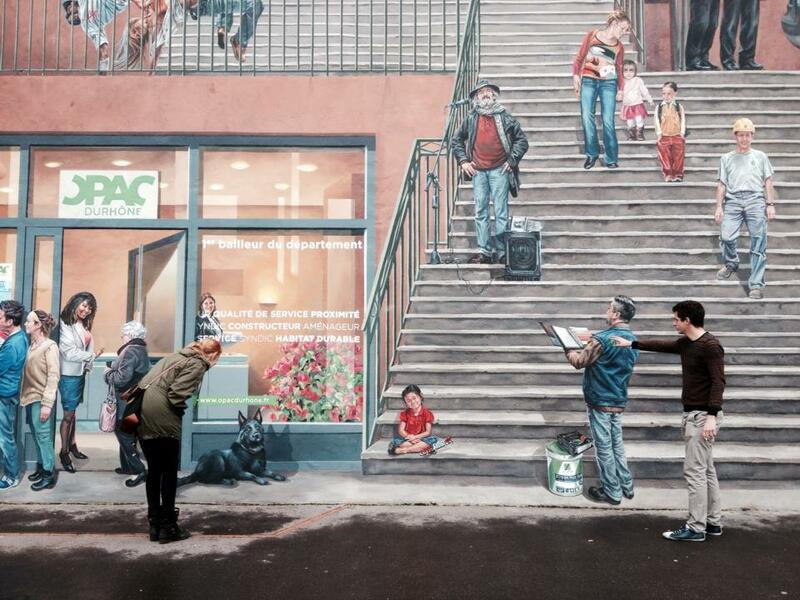 It is a huge mural painted on a previously ugly wall, and it was pretty fascinating to see and to pose with. We traversed (don’t know how else to explain it) all the way down to the city center again from Croix-Rousse, and went to Constant’s favorite market. 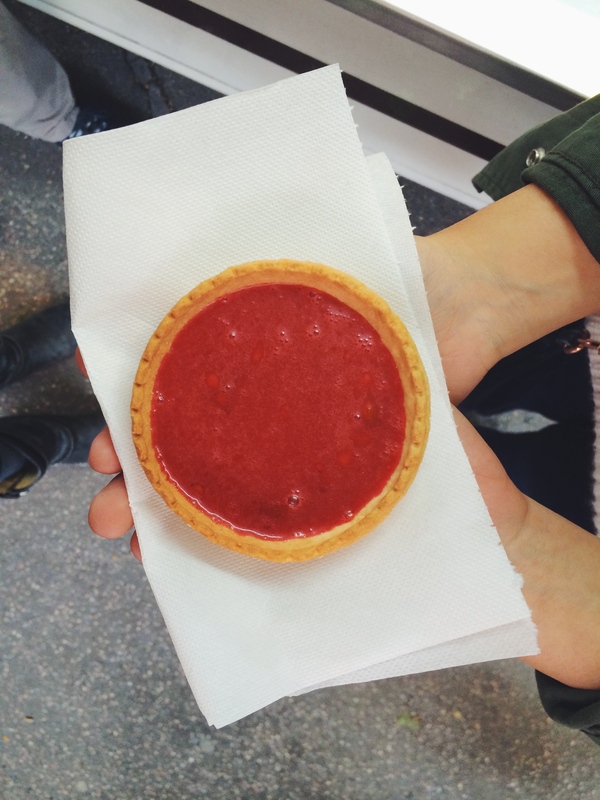 Here we had a Lyon classic, a Praline tart, and bought sausage to bring home. I can’t describe this sausage either, but it’s incredible. We chose the one with olives in it. Nat and I split from Constant for a bit to shop, but met up to trek over to Parc de la Tete d’Or, the biggest public park in Europe I believe. There’s a free zoo in the middle of it! By this time we were completely beat and went home for a bit of a rest. 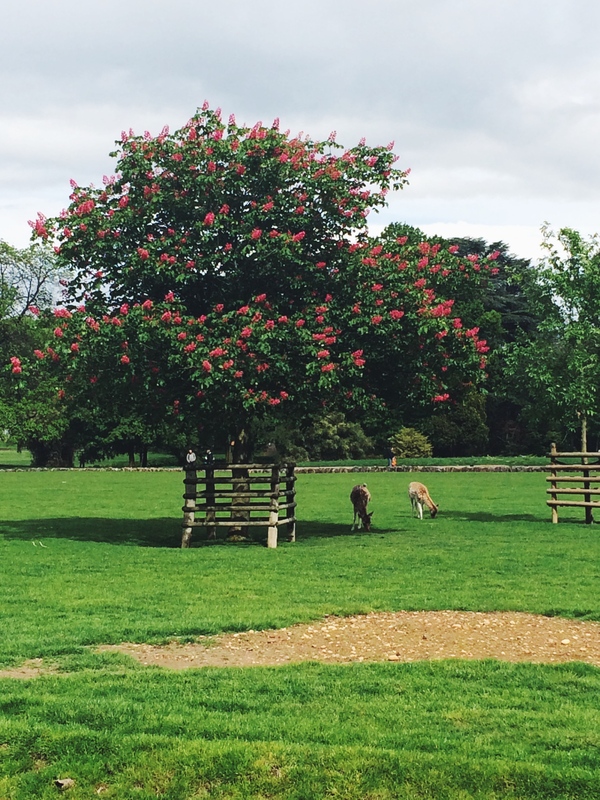 In the park, see the animals? It was time to leave Constant’s house to stay at the French house we visited the first night, since Stan (the owner) lives in the city and it would be easier for us to get around in the morning if we stayed there. It was hard to say goodbye to such a perfect little home and his sweet parents. 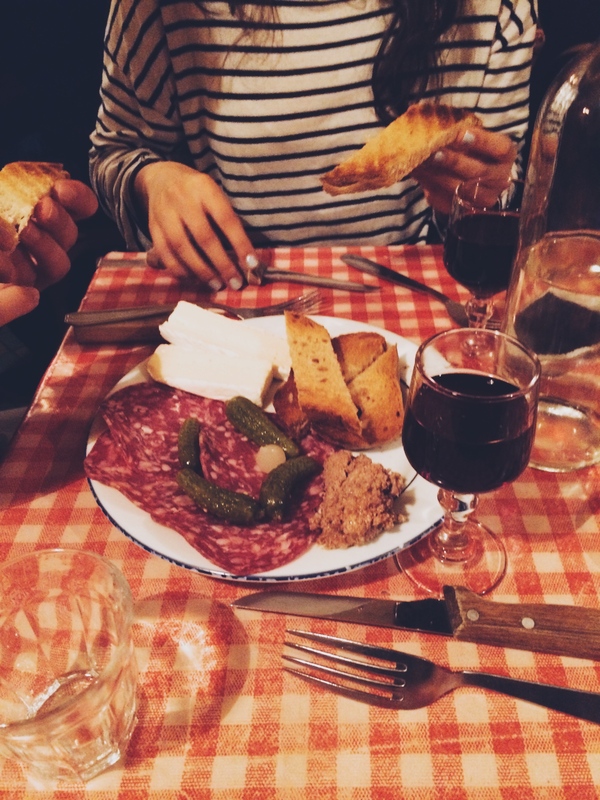 We couldn’t be sad for long because Constant took us to the most amazing restaurant for our last meal; L’Epicerie. This place is known for their tartine. Tartine is a piece of amazing bread with melted cheese on it, but that description does it no justice. 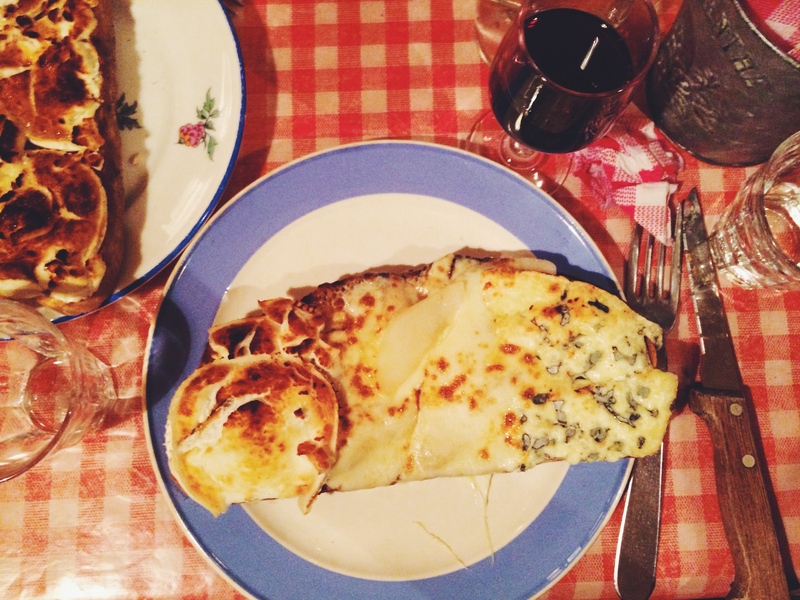 The bread is thick and toasted, the cheese is a variety– Nat and Constant ate goat’s cheese with honey on theirs, I had three cheeses with pear on mine. It was heaven. We started the dinner with bread, brie, terrine (ground cow liver), and rosette (Lyon sausage). That blew me away enough, but then came the tartine. We were full, but since it was our last night, Nat and I went for the most delicious tart combo and ordered a praline tart and a lemon meringue tart to share. Food coma, but worth it. Afterwards we went to another party with Constant’s friends before returning to Stan’s. We got up and left Lyon in the morning. Started with this at L’Epicerie. Look at it! 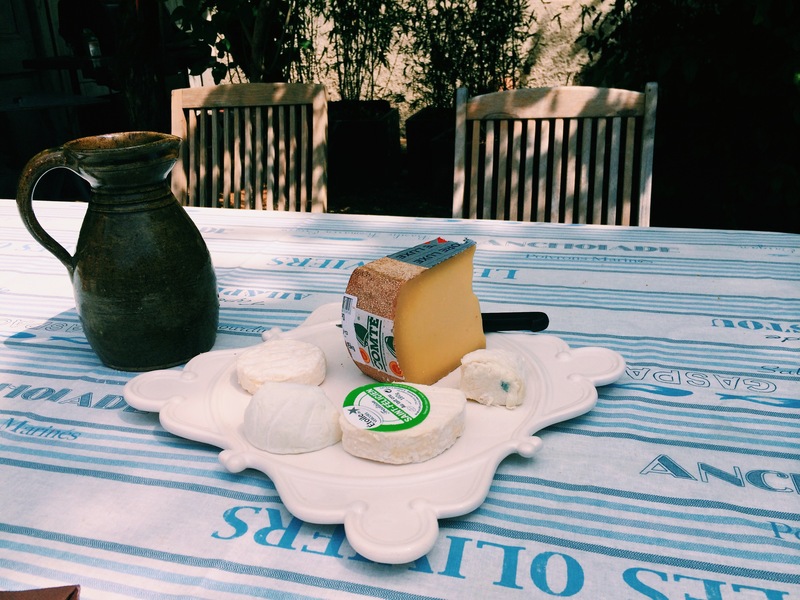 The three cheeses were mozarella, chevre, and fourme. Me and Constant at our last dinner. I feel like I’m still living in a little French dream. I’ve realized that my favorite way to travel is to go to places where I know people enough that they can help me navigate and really see the city’s gems. This worked out in Dublin last semester, and luckily Prague was small enough to get around easily ourselves, but a friend could have been nice. This was my last trip in Europe before I return home, and it was hard flying into Amsterdam realizing that the next time I’m on a plane I’ll be leaving. This was also a great way to spend quality time with Nat before we have to part, like we don’t spend enough time together already. 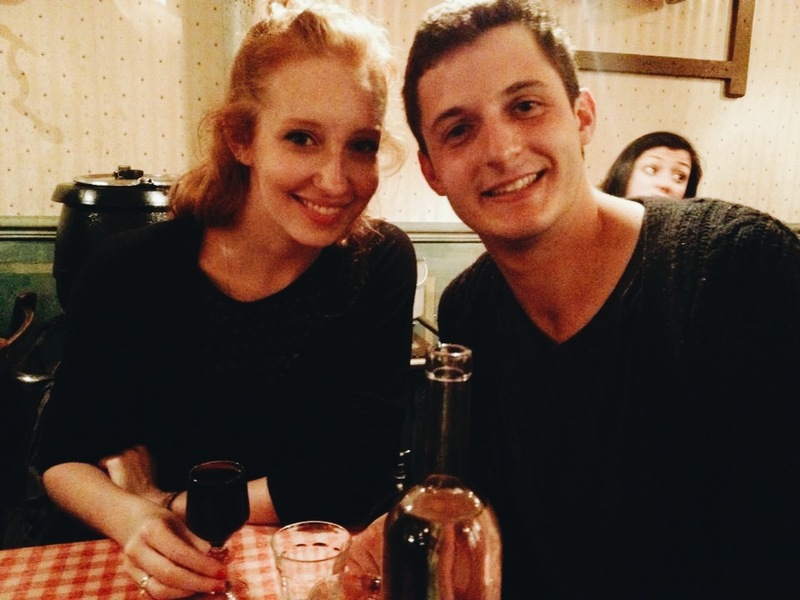 We’re both smart and easy travellers, and I love that we both had friends in Lyon and left with an even broader group of friends in Lyon incase I end up going back. I don’t want to end this post because I don’t want the adventure to be over. It’s times like these when I realize I can’t ever lose this adventurous side of me, or I’ll end up missing a whole lot.